Anne E. Beidler is a former director of Family House, a drug and alcohol rehabilitation center in Philadelphia, PA. She holds a doctorate in educational research from Lehigh University. In addition to The Addiction of Mary Todd Lincoln, she is also author of Eating Owen, a historical novel. Mary Todd Lincoln, wife of the president we have immortalized, has always been difficult for us to understand. She could appear poised and brilliant one moment yet rude and ugly the next. Sometimes competent and strong, able to entertain dignitaries from around the world, at other times she appeared dependent and weak. At times she seemed utterly beside herself with sobbing and screaming. Historians have mostly avoided saying very much about Mary Todd Lincoln except in reference to her husband, Abraham. To many it would seem that Mary Todd Lincoln is still an embarrassment in the tragic story of her martyred husband. But Mary Todd Lincoln lived her own tragic story even before Abraham was murdered. She was an addict, addicted to the opiates she needed for her migraine headaches. 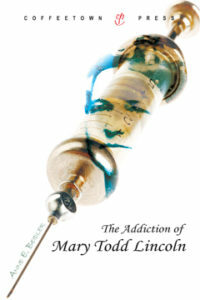 Seeing Mary Todd Lincoln as an addict helps us understand her and give her the compassion and admiration she deserves. In her time there had been no courageous First Lady like Betty Ford to help people understand the power of addiction. There was no treatment center. In Mary Todd Lincoln’s time there were many addicts at all levels of society, as there are now, but it was a more socially acceptable condition for men to have than for women. More importantly, addiction was not very well understood, and it was often mistreated. Because Mary Todd Lincoln’s only surviving son, Robert Lincoln, made a great effort to protect his mother and his family from journalists and historians, he intentionally destroyed most of Mary Todd Lincoln’s medical records and many of her letters. What he could not destroy, however, is the record of Mary Todd Lincoln’s pain and the record of how she behaved while living with this pain. In The Addiction of Mary Todd Lincoln , we can see clearly, for the first time, what Mary Todd Lincoln had to live with and the courage it took for her to carry on. As the Lincolns moved up in the Springfield social world, there were also more social duties for Mary to attend to, so perhaps she had little time for correspondence. At any rate, we have no letter from her that was written near the time when her son Eddie died at age four. We know that she and Abraham nursed Eddie, day and night, for almost two months. We know that both parents were devastated, that Mary was especially distraught. Although she was soon pregnant again and her life remained at least outwardly the same as it had been, we can be sure that Mary’s sadness about Eddie never completely went away. We remember, of course, that a terrible war was going on, right at her doorstep, while Mary Todd Lincoln was in the White House. There is, however, very little about this war in her letters. We know from other people that she was deeply concerned about the war, that some of her own relatives died fighting the North, that she did what she could for the war effort in Washington, yet in her letters she sounded like most of us—concerned about her immediate family. Physically also, Mary Todd Lincoln felt increasing pain in her life. Indeed, it is in this period that we can trace the beginnings of what was to be a dominant theme in Mary Todd Lincoln’s life. Pain, sheer physical pain. From her early twenties on, she was plagued with headaches. The earliest reference to these headaches is in a letter from Abraham to Mary in 1848. At this time they had two small sons and Abraham was away much of the time with his work. He inquired about her headaches, which must have already been a problem for at least nine years. But she was not free from headache, nor from other pains. Indeed, a sentence from one of her letters written in 1861 could speak for the rest of her life: “The weather is so beautiful, why is it, that we cannot feel well” (Turner 106). It would seem that throughout the rest of her life Mary Todd Lincoln never again felt well. But her headaches were her most debilitating source of pain. Perhaps it is not surprising that the presence of pain in her life left Mary Todd Lincoln sometimes feeling sorry for herself. This theme of self-pity was not before apparent in her life, but by the White House years, even though she was rich and famous, Mary Todd Lincoln increasingly felt that her lot was unbearably hard. No doubt few people could see how Mary Todd Lincoln was in any way a “slave to the world,” but that is the way she felt at least some of the time during the period of her life when she was working hard at being a good wife and a good mother. Mary Todd Lincoln’s terrible headaches may have been exacerbated by the two carriage accidents she had while she was living in Washington. More pain. How did she feel? During these years Mary Todd Lincoln felt close to her husband and children, but physically she felt increasing pain accompanied by a good measure of self pity.